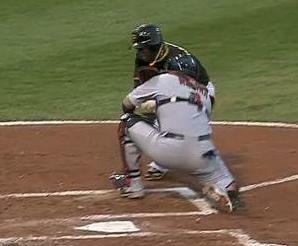 Cardinals catcher Yadier Molina understands the concept of blocking the plate. So does his manager, Mike Matheny, a big league catcher for 13 seasons. 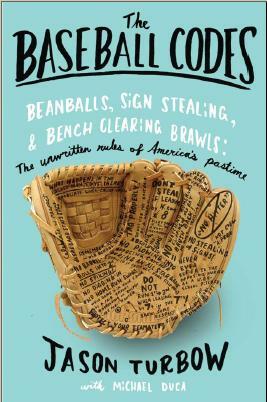 Which is what makes their professed confusion over the propriety of a play in which Molina was bowled over during Tuesday’s 9-0 loss to Pittsburgh so confusing. As Josh Harrison rounded third on a second-inning single by Jose Tabata, Molina positioned himself in the baseline, awaiting the throw from right fielder Carlos Beltran. The catcher’s positioning left Harrison little choice. A slide would have put him into the catcher’s shinguards. A wide-slide-and-swipe-tag combo was also out of the question. So Harrison—only 5-foot-8, but 190 pounds—took what was clearly his best option, and lowered his shoulder. Plate ump Adrian Johnson showed an unfortunately quick trigger, immediately warning both benches—a decision that elicited an anmiated conversation with infuriated Pittsburgh manager Clint Hurdle, whose team had been stripped of an opportunity to respond to what had effectively been the first shot fired. Beltran made the point perfectly, only in reverse. By positioning himself where he did, Molina left Harrison no choice about what to do. The only way to get to the plate was through the catcher. Perhaps the Cardinals’ players were covering for Westbrook, who likely acted on his own. Maybe they really meant it. Either way, Johnson’s warning delayed until today—the final game between the teams this season—any response for which the Pirates may have opted. If matters are to be further settled, it will happen tonight. From the play it looked as though Harrison lowered his shoulder into Moina’s head. 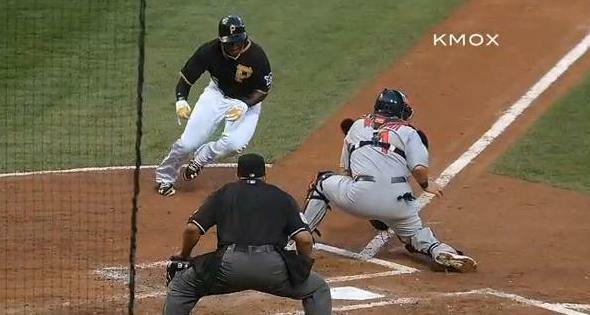 On replay it looked more like Molina’s head just happened to turn into where Harrison’s lowered shoulder was headed. It is not clear Molina could have either cleared a lane to the plate nor avoided the shoulder-head impact, given he had to handle the hop on the throw from Beltran before applying the tag. The thumping of Harrison by Westbrook was a relatively minor one, and Harrison gladly took the base without so much as a glance towards the mound. Molina said he thought it was a clean play, which is probably the best way for it all to end.